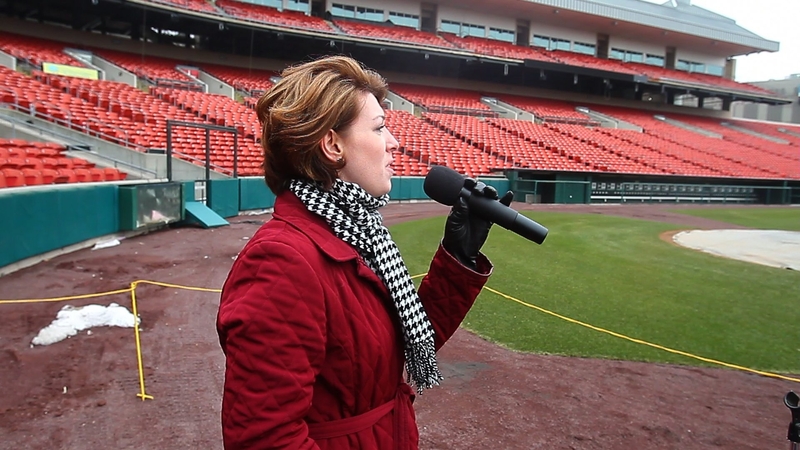 April Sroka of Depew auditions to sing the Canadian and American national anthems for the Buffalo Bisons at Coca Cola Field in Buffalo on Saturday. The sky cast a blanket of gray over the Bisons’ home field. There were no peanuts and Cracker Jacks on Saturday at Coca-Cola Field. Just mugs full of hot tea and coffee. Those entering wore hats and mittens – not baseball caps – as temperatures clung to the high 20s and forecasts projected even more flurries in this winter-weary city. But this is Buffalo, home of the winter brave. The bitter chill made little difference to the dozens huddled outside the stadium waiting for the doors to open so they could audition to sing the national anthem. “It feels more like home when it’s cold out,” said Sam Newberry, noting that the brisk air brought a strange comfort. The annual spring auditions typically draw about 300 people, as area residents and fans vie for a spot to perform before summer crowds that sometimes hit 18,000 for home games. The performers lined up before the doors opened at 10 a.m., some returning for their second or third year trying for a coveted spot on the lineup. Once the doors opened they filed in, snaking down the stairs between the bleachers, working their way to the field, where one by one they performed both the U.S. and Canadian national anthems. They were young and old, their experience ranging from church choirs and school musicals to bands. “I saw it was available, and I’ve always wanted to do it,” 11-year-old Madeline Fecio said of the audition. Some barely bellowed out a few lines before being asked to move on. Only a handful will be offered a spot in the singing rotation, but for some, just having the opportunity to try out at the field was worth the effort. Even if that meant trying to stay warm while waiting for an hour. The Bisons’ season starts this week, regardless of whether the temptress that is spring commits to more than just a brief flirtation. The team’s home opener is Thursday, and while lawns across the region are still recovering from two blizzards, the stadium’s grass is greener. “We’re pretty confident spring will start this week,” said Brad Bisbing, the team’s director of public relations. “We’d like to think we’re the official start of spring here at the ballpark,” he clarified. It’s unclear whether Mother Nature follows the Bisons’ schedule. The National Weather Service expects temperatures in the mid-40s most of this week, although the forecast continues to fluctuate. That brought little comfort to 11-year-old Jessica Hall, whose nerves were overcome by cold waiting for her chance to audition Saturday morning, just hours before light flurries were expected to cover the region. Bison workers taking names and handing out numbers stared longingly at the jumbo screen flashing images of warmer, sunnier days. “I wish it was that warm right now,” one remarked. Patricia Zinter waited outside in the stands over an hour to have her chance to wow the judges.